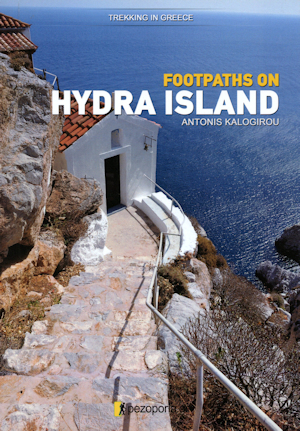 Guided walking tour to the Lighthouse at Eastern end of the island, in Zourvas (Zorva). Note that this is a quite demanding and long walk, so it's only for people who think they are able to do it! Read the information carefully. Our participants are soon getting a group email from me, with this year's daily schedule, plus request to reserve activities you want to choose. (Don't do anything before you get the email; I am still waiting for some confirmations from our local crew). This Walking Tour will happen on Saturday, but only if we get a minimum of 20 participants. With 20, the price would be 30 eur, and is getting cheaper if we have more. The Walk will be one way only. A boat is going to pick up the group at the lighthouse. A local English speaking guide will be with the group all the time. Below we have two maps showing the route in red. Click on the maps to see them in bigger size. 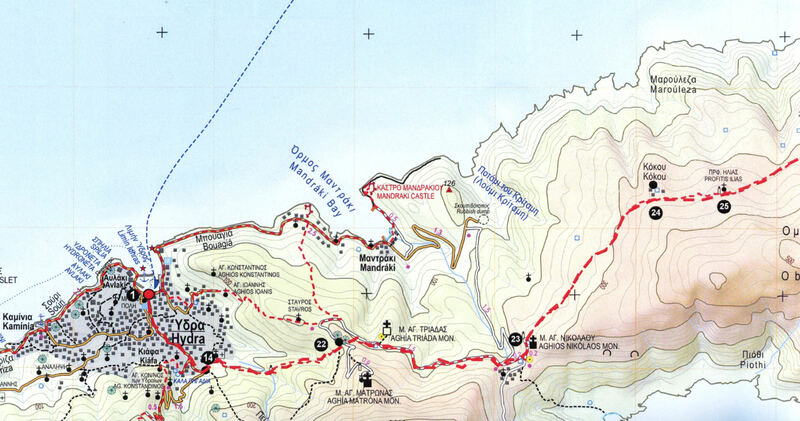 Note that we're also going to do our traditional walk to the Monastery of Eliah close to the City of Hydra. It is free of charge, it's scheduled to Sunday morning and will again be guided by Joy and Marc. There will also be an around-the-island boat tour with stops at selected beaches every day from Thursday to Monday, and a short Sunset sailing on the same days. Prices to be confirmed by the boat owner. (I have not got confirmation that this sailing is possible also on Saturday when the boat is going to the Lighthouse = two boats would be needed). We are going to rent the open-air Cinema Club for two or three nights, and will be screening two different archive tapes. (Today we have 190 attendees listed, capacity of the Club is 160). For the rent and other local costs we will collect a participation fee of 15 eur from all participants. More info about all those activities and everything else in the group email, soon.